I don’t think my memory goes back far enough to remember a time when there wasn’t a box of Constant Comment in the pantry. True to its name, tea has been a constant presence in my life as the first responder to wintry sniffles and a metaphorical shoulder rub when I need a mid-afternoon pick-me-up. 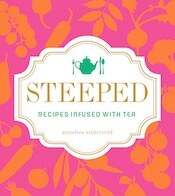 Now, with Annelies Zijderveld’s new book Steeped: Recipes Infused with Tea , I’m ready to take tea further. The genius of this book is predicated on the idea, as Annelies writes, of “the potential of using tea as a spice, rather than only a drink.” Seen in this light, the idea of incorporating the leaves of the Camellia sinensis plant in cooking isn’t a stretch; we use rosemary, mint, cardamom, cinnamon, and other herbs and spices with abandon, so why not tea as a versatile flavor-enhancing ingredient? 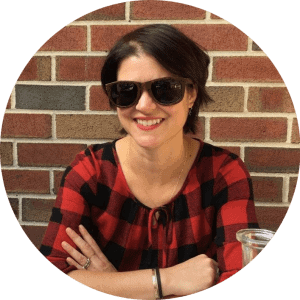 Annelies (who, full disclosure, is a friend and fellow food writer) has a near-encyclopedic knowledge of tea and brings the same calming, immersive sense of pleasure of sipping a cup to reading every section of the book. Her introductory passages on tea styles and recommendations on brewing tea are inordinately fascinating, and her zest for making tea a multi-faceted ingredient shines throughout the book. If you happen to have some leftover masala chai or chamomile tea sitting on a pantry shelf, flip to the list of recipes indexed by type of tea used—a lifesaver for those three bags of lapsang souchong that have been languishing in my house for a few months. Organized by mealtimes—morning tea, midday tea, high tea, and more—Steeped showcases tea-infused recipes for breakfast, lunch, dinner, and beyond. While sweet recipes get their own chapter and are interspersed throughout the book as well, it’s the savory recipes that offer the most eye-opening thrills for adventurous cooks. The recipes are accessible, but the flavors surprise with a smile. 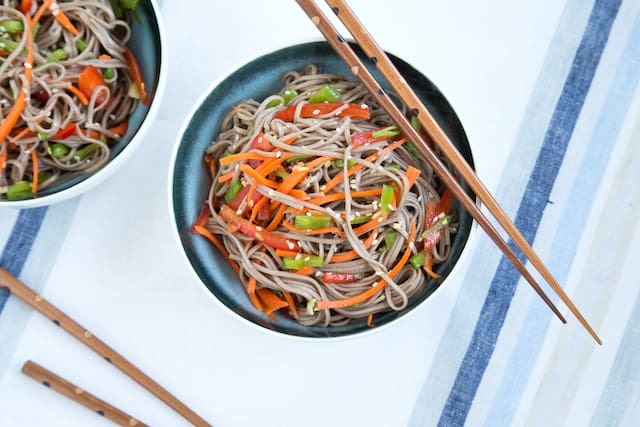 Earl Grey lends mellow earthiness to the vinaigrette in a cold soba noodle salad, blending nicely with sesame oil and maple syrup—and Annelies is right, it does taste even better once the noodles and vegetables have marinated overnight in the fridge. Matcha, the brilliant green powder that’s the current trendy darling of the tea world, is whisked into simple crepe batter for savory sandwich wraps. Annelies fills them with sautéed summer squash, ricotta, and artichoke hearts, but I see them as a year-round staple for the veggie odds and ends that are a constant presence in my crisper drawer. Timing is everything with tea, and that extends to many of the versatile pantry recipes in the book. Take note that green tea vinegar, lapsang souchong honey, or tea extracts (made in the same manner as homemade vanilla extract) need a few weeks to “steep” before you can reap their bounty. The wait is worthwhile, even a few days for tea-infused yogurt. 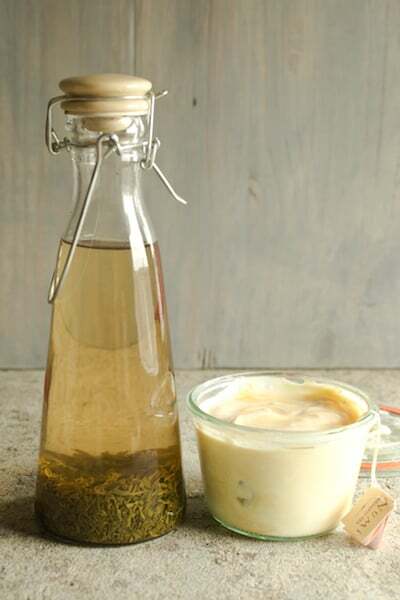 It’ll quickly become your go-to condiment for spooning over roasted vegetables (like the twice-baked garnet yams in the book) or just eating with fresh fruit, as I did with rooibos-infused yogurt and sweet-tart pineapple chunks. One of these pantry staples, a clever riff on on of my favorite drinks that Annelies calls Arnold Palmer powder, is also poised to become one of my favorite spice blends. As I’ve mentioned, Arnold Palmer is a native son of western Pennsylvania, so I’ll always raise a glass in allegiance to one of my hometown homies. It doesn’t hurt that the tart and tannic blend of lemonade and iced tea that comprises an Arnold Palmer drink might be the most harmonious duo since Simon & Garfunkel, either. By blending dried lemon peel with classic English breakfast tea, Annelies transforms this refresher into an intensely fragrant powder that can be folded into almost any baked good—like the poppy seed muffins in Steeped—or sprinkled on a sweet snack as you see fit. 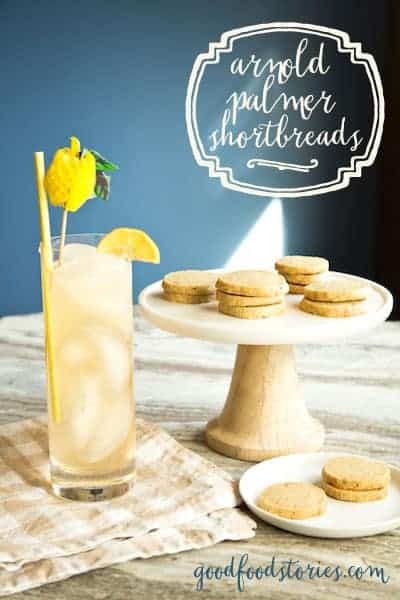 In the recipe that follows, Arnold Palmer powder brightens up buttery shortbread cookies that are tailor-made for dunking in a cup of tea or nibbling on the front porch with an icy Arnold Palmer in hand (or a boozed-up version, if you prefer). Make the Arnold Palmer powder a few days in advance (as the recipe notes) and you can bring these cookies together in a snap. But, be forewarned: once you start sniffing the perfume of the lemons drying in your oven, you might want to make a double batch on the spot to use as an oatmeal topping, chicken rub, or even for adding into whipped cream. That’s what happens when you start cooking with tea. . . it has a way of steeping—er, seeping—its way into your consciousness. Preheat the oven to 170˚F. Line a large baking sheet with parchment paper or a Silpat liner. With a vegetable peeler, remove long strips of zest from the lemons, taking care not to take the bitter white pith off along with the zest. Place the strips on the prepared baking sheet and dry in the oven for about 2 hours, or until the strips are extremely shriveled and brittle. Finely grind the dried lemon in a spice grinder to get about 1 tablespoon lemon powder. Transfer to a small bowl. Remove the tea from the bags as needed and grind in the spice grinder to get about 1 tablespoon finely ground tea. Return the tea and lemon powder to the grinder and add the sugar. Grind together to finish the powder. Whisk the flour, Arnold Palmer powder, and salt together in a bowl and set aside. With a stand mixer fitted with the paddle attachment or an electric hand mixer, beat the butter and sugar together on medium speed for 2-3 minutes. Reduce the mixer speed to low and add the flour mixture incrementally until fully incorporated. Lay 2 large pieces of plastic wrap on a clean work surface and divide the shortbread dough evenly between the 2 pieces. Pat into a rough cylinder, then use the plastic wrap to roll the dough into logs about 1 to 1 1/2 inches in diameter and about 8 to 9 inches long. Wrap tightly and refrigerate for at least 2 hours until hard. Preheat the oven to 300˚F and line 2 large baking sheets with parchment paper or Silpat liners. Bake for 15-20 minutes until the cookies are golden, matte, and barely browning at the edges. Transfer to wire racks to cool completely. The Arnold Palmer powder can be made up to three days in advance, and the dough can be refrigerated overnight or frozen for up to 3 months, wrapped tightly in plastic wrap and foil. Once baked, the cookies will stay fresh for up to 1 week when stored at room temperature in an airtight container.